are a great present and can be used as full or part payment towards any of our courses. The cost depends on the content and length of the course, and starts from £50 per hour (plus ingredients) for a minimum 2 hours. DON'T SEE A COURSE YOU WANT? School of Cake Decoration - NEW CLASS DATES ADDED ! 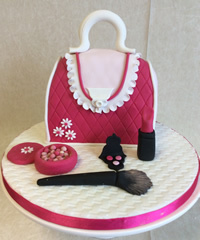 We offer a range of cake decorating courses for all abilities. 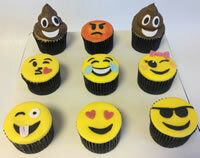 From cupcake decorating classes and Basic Sugarcraft for beginners, to advanced courses for experienced cake decorators including PME Professional Diploma courses with modules in Sugarpaste, Royal Icing and Sugar flowers. 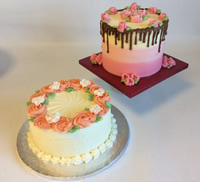 Our cake decorating school is at our design studio in Moulsford on the Berkshire / South Oxfordshire border, midway between Reading and Wallingford, within easy access of Wantage, Didcot, Henley-on-Thames, Pangbourne, Goring & Streatley and Newbury. 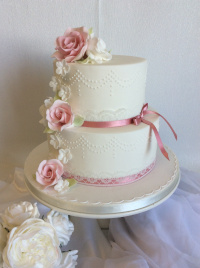 The school is run by Catherine Scott and classes are taught by Catherine and Kim, both PME-approved tutors with many years experience of designing and making wedding and celebration cakes. Course prices are INCLUSIVE and cover use of all equipment, cakes, icing and ingredients that you need to create and decorate your sugarcraft masterpiece to take home at the end of the course. 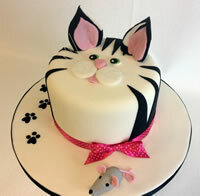 A FUN cake decorating workshop suitable for beginners. Learn how to decorate a cake like a professional! Fully inclusive - 3 hours tuition unless stated and EVERYTHING you need to enable you to take away a beautifully decorated cake. 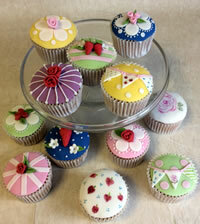 Come along and learn how to make some beautiful themed cupcakes. We will teach you how to cover your cakes with sugarpaste domes and swirl toppings and then decorate them with themed decorations & toppers. 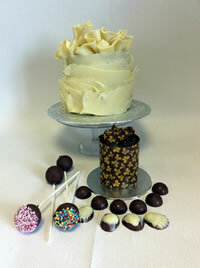 You will take home a box of 6 beautifully decorated cakes. 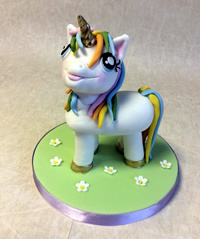 This course for someone with experience in covering with sugarpaste. 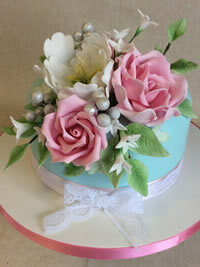 These short courses cover one particular aspect of cake decorating/figure modelling. The courses can be booked individually according to interests and some include moulds or nozzles used in the course to take home. The next Guest Tutor we have visiting is Dawn Butler from Dinky Doodle Designs in which she will be teaching Airbrushing. Dawn will be with us the weekend of 8th & 9th June 2019. The Saturday is for beginners, which Dawn will be teaching airbrushing techniques on edible icing sheets, which you will take home. 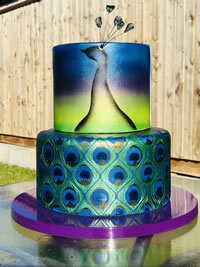 The Sunday is for the advanced airbrusher (those that have attended an airbrushing course previously) where you will be working on a two-tier dummy cake with a peacock design. All equipment is provided and included in the cost and you take your work home with you. If you book both days together the cost will be £275! FULLY INCLUSIVE. We provide 4 hours tuition and EVERYTHING you need. Come along to Stage 1 and learn how to fill and smooth ice a round cake with buttercream. We will teach you how to pipe a border around the base and also pipe a circle of flowers and leaves with coloured buttercream around the top edge. Stage 2 – some experience of using buttercream. 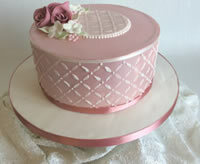 We will teach you to smooth ice a round cake with ombre shaded buttercream to include a drip. This will also include the piping of flowers and leaves. You will take home your decorated cakes at the end of each session. Book both courses and save £10! A course designed for beginners to intermediate in modelling. Working from photographs in some cases to incorporate details of features to personalise their figures. You will make one sitting, one standing a child model. 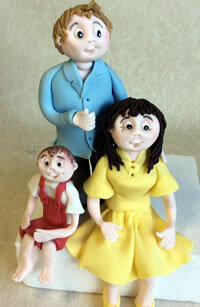 •	fully inclusive - 2 hours tuition and EVERYTHING you need to enable you to take away a beautifully decorated cake. Please be advised that an adult will be required to stay on the premises and be able to assist your child if required. •	There is no age restriction but this course is ideal for children from approx 7 years. An intermediate level course which would suit someone with some experience or students who have completed our introduction to Sugarpaste courses or the PME Diploma Sugarpaste module. Thank you so much for another fantastic class. Great fun and I learn so much from you. Your cakes are amazing! A brilliant escape from the hustle and bustle... And I created something beautiful!! Catherine made us feel so relaxed and was incredibly positive about our creations... A really well spent evening. Thank you. All our cake decorating classes and PME Professional Diploma courses are held at our Moulsford studio on the Berkshire / South Oxfordshire border, and we have plenty of free parking. We are near Streatley between Reading and Oxford, and close to Wantage, Didcot, Pangbourne, Goring, Maidenhead, Henley-on-Thames and Newbury, and just 20 minutes from the M4 if you're coming up from London.